Mike Hobbie is retiring as the head coach at San Marino after a successful eight-year run. 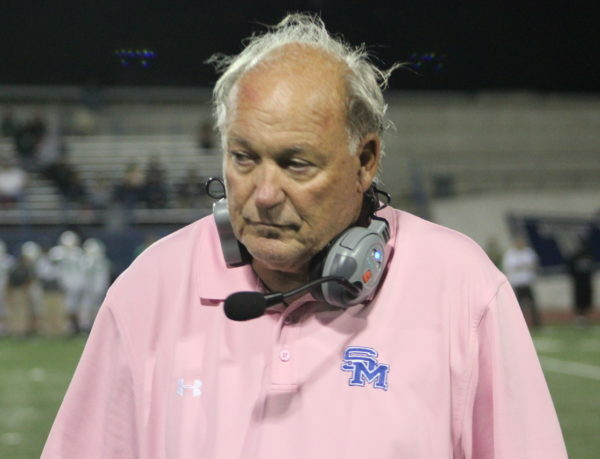 (San Marino) – Mike Hobbie has stepped down as the head football coach at San Marino and will retire at the end of the year, the school announced Wednesday. Hobbie spent eight years at San Marino compiling a 71-24-1 record overall and 9-7 in the playoffs as the Titans made the playoffs in all eight seasons under his regime. In Hobbie’s first year, after taking over for Mike Mooney after the 2011 campaign, San Marino went 7-4 in 2012 and lost to San Dimas in the first round of the playoffs. Hobbie guided the Titans to the CIF Championship in 2015 going 14-0 culminating with a title clinching 45-28 win over Charter Oak. San Marino then rallied to beat Sierra Canyon 36-35 in the State playoff game before losing its only game of the season – a 56-21 defeat to Central Catholic in the State Championship game. This past season the Titans went 9-2-1 and advanced to the second round of the Division 9 Playoffs before falling to North 33-28. Hobbie, who coaches the baseball team too, will lead them one more time on the diamond, before retiring at the end of the school year. San Marino will now begin the search to fill Hobbie’s shoes, which will be no easy task. 8 Comments to "Hobbie Signs Out at San Marino"
I do not think that Hobbie was scared to play El Monte. In two years he out scored them 123-36. That is a 87 point difference. And not to mention the JV team beat El Monte also. @NWO: We recently lost a great coach in the SGV, Santa Fe’s coach Mahlstede. The Santa Fe faithful were able to show him their love and appreciation before his passing. A simple thing we can all do is remember our coaches and teachers that helped us and our children along the way. A kind word, a letter or card or even an old fashioned phone call goes a long way in making someones day. If you don’t know how to reach them call the school, they will know. Surprised there are only 4 comments? MVS must not reach San Marino. Successful indeed. Thank you for the time you spent devoting your life towards the development of adolescent student-athletes. The impact of high school football coaches resonates in the life of many. Congratulations to Coach Hobbie and his lovely wife Suzanne on retirement. They both have dedicated many, many years as educators and mentors to students across the country. I saw first hand how his leadership, work ethic, football knowledge and integrity transformed both players and coaches. Enjoy the good life Coach, you’ve certainly earned the rest. I worry about new retirees, who find they have way more time on their hands than they know what to do with. That’s why I hope Hobbie has a hobby.